I feel like Keanu Reeves in The Matrix. Woah. 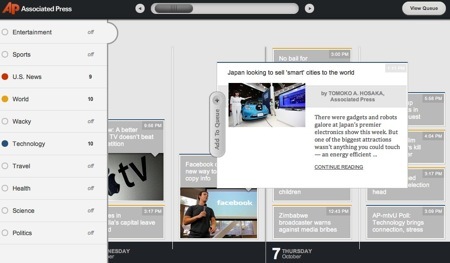 When Zee at Next Web posted this HTML5 news timeline from AP Labs, I was blown away. It’s such an intuitive, rich interface for exploring news from multiple angles, and after a lot of years of stagnation in terms of interface design, I’m really excited to see HTML5 and touch interfaces motivating designers and coders to explore some new ideas. 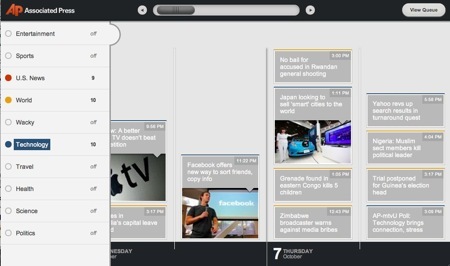 You can explore stories by time, choosing different subjects as you go. The stories drop into the timeline with colours related to their topics. Clicking on a story in the timeline opens up a small preview window. You can then open the full story that brings up this three-pane window in which you can make adjustments to the text, see additional information about the image with the story and read the story itself. Now, as Conrad Quilty-Harper says on Twitter, it “runs like a dog on the iPad”. I was viewing it in Chrome on a four-year old, much-repaired MacBook. It was very fluid on the MacBook. I should probably try it in Safari and see if it has something to do with Safari’s support for HTML5. That might explain why it’s slow on the iPad. However, Conrad has a point. Creating a site in HTML5 should allow it to run on an iPad, but it looks like it might take some optimisation. However, designing the interface is half the battle. As a first effort, it’s an excellent starting place, and it’s very exciting to finally start seeing some experimentation with interface like this. HTML5 might not be production ready, according to the W3C, but it’s very promising to see this level of sophistication at this stage. 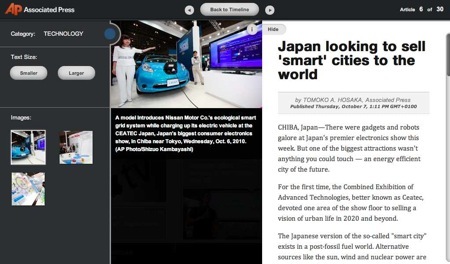 This entry was posted in Innovation, Journalism, Media 2.0 and tagged AssociatedPress, design, HTML5, interface. Bookmark the permalink.